When I was a kid in grade school, Fridays were a two-edged sword. On the one hand, it was the last day of the school week. On the other hand, we were Catholics and could eat no meat on Friday. That meant even Bacos (maybe they were called bacon thins), those bacon-flavored crackers! I always tried to cram in one last ham or salami sandwich before bed on Thursday to see me through the long Friday fast, and I always stayed up past midnight on Friday (so, technically it was Saturday) for another one. Even better, sometimes I’d wait up for my dad to get home (he was a bartender and got home around 1:30 a.m. or so). Sometimes he would fix some Italian sausage that he had gotten that day from Vincent Ray’s store. Vincent Ray made the best Italian sausage in the world. One of our favorites was the kind that Vincent stuffed with provolone cheese. It would ooze out into the skillet while cooking … But, I digress. Peanut butter and jelly sandwiches were the mainstay of a Friday lunch. There was no way in Hell (which is where we’d go for eating meat on Friday) I was going to eat those awful fish sticks with ketchup along with that miserable macaroni and cheese they served in the school cafeteria. For a Catholic school in a predominantly Italian parish, our school cooks were pretty lousy. Sorry, Mrs. Cipolla. Friday night dinners at home were another matter. As much as I complained about no meat, my folks were adept at providing good meals without it. No one in my family was really wild about fish. I don’t remember ever having to suffer through tuna casserole. (I did try making tuna tacos, from the recipe on the back of a package of Spanish Gardens corn tortillas. They weren’t bad, but that’s another story.) Picking the bones out of any kind of fried or baked fish made eating them more trouble than it was worth. Salmon patties were the one exception and we loved them. Save for the irritating fact that Mother Church had decreed that we not eat meat on Friday, most of our Friday dinners were good enough to make me forget about meat. Standard fare was pizza with mushrooms and black olives (my mom would also make one for herself with anchovies), macaroni and peas, and Italian omelets. Sometimes we’d have fried shrimp. We also had artichokes fairly often and they were always a special treat. Artichokes were cheap in those days. Ten cents apiece comes to mind. “Poor people’s food,” my dad said. The way he fixed them, though, they were fit for a king. Learn to make these yourself, and any day can be Friday. Aside from the artichokes themselves, the other essential ingredient for this dish is the stuffing, made with Romano cheese and Italian breadcrumbs. It is also the most time-consuming part of the process. In fact, if you don’t have any cheese and breadcrumbs on hand you might as well forget about artichokes and make something else for dinner. You’re not going to be able to make good cheese and breadcrumbs and cook the artichokes all in one evening. But cheer up. Cheese and breadcrumbs is one of those things that a lot of is as easy to make as a little. Once you’ve made the cheese and breadcrumbs, you have a staple ingredient for a whole slew of Italian dishes such as veal, chicken or eggplant Parmigiana, and meatballs. I think the proper name for the cheese and breadcrumbs is modiga, but my dad always called it, simply, cheese and breadcrumbs. I never heard him or his mom call it modiga. For best results, make it a few days, or even a week, ahead of time. 3 15-oz cans of plain Italian bread crumbs. Be sure to use plain breadcrumbs, not Italian-style (see Notes). Separately, chop the garlic, mint, basil and parsley fine, but not too fine. Add to bowl. Add 3 cans breadcrumbs to bowl. Fill an empty breadcrumb can with grated Romano. Add to bowl. Taste test for salt, add more if needed. You can use this the same day, but for best results make one or two days ahead of time. One week is even better. Keeps indefinitely in the freezer. We always used Progresso or Roma Bakery breadcrumbs. Others will work too, I suppose. Whatever brand you get, use plain breadcrumbs. Do not use the kind marked Italian-style that have the cheese, etc., already in them! Although the recipe requires 1 full breadcrumb can of Romano cheese, get at least 3 pounds of Romano. You’ll need some additional plain cheese (and you can use the rest for other things). Kraft cheese is not acceptable for this recipe. Now you have cheese and breadcrumbs. Let’s make the artichokes. You must trim the artichokes. 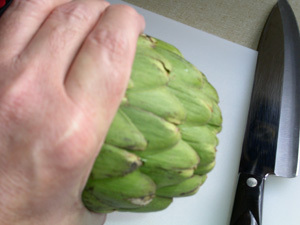 Cut off the stem, if any, flush with the bottom of the artichoke, and trim any leaves from them. Also cut off the rough part where the stem was cut from the plant. Save the stems; they taste as good as the heart. The next step requires a very sharp knife, as the leaves are tough. I’ve seen this done with scissors but a good knife is better. You’re cooking, not cutting out doilies. Hold the artichoke so that you are compressing the leaves back together. Wrap your hand around it and squeeze just below the tips of the largest outer leaves. Along that line, cut off the top of the artichoke. This, roughly, cuts it in half. Discard the cut leaves. Take the lower half in both hands and gently twist, sort of, spreading the leaves. The artichoke will make a curiously satisfying squeaking sound. Don’t skip this step. Soak the artichokes in a deep bowl of cold salt water for at least half an hour, up to an hour. This kills the bitterness and also cleans and refreshes the artichokes. 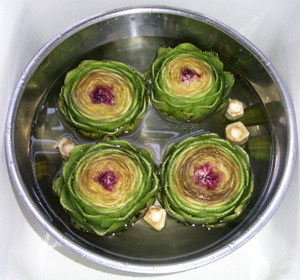 After soaking, drain the artichokes and pat dry. The leaves will have spread open more while in the water. 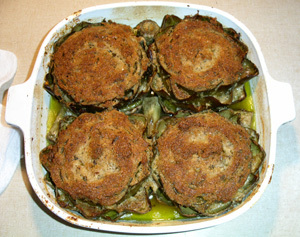 For the stuffing, put one cup of cheese and breadcrumbs and one cup of plain Romano in a bowl. Add enough olive oil to make it pasty. Take the cheese/olive oil paste and, with a spoon or your fingers (whichever works best for you), stuff the paste between the leaves of the artichoke. Start from the outer ring of leaves and work your way as far into the center as you can. The more paste you can stuff in, the better. (If you run out, no big deal. Make more.) When you’re done, put a cap of paste on top of the artichoke. Enamel or Pyrex baking dishes work best. Cast iron pans discolor the artichokes (they’ll turn black). 350 F for about an hour and a half. During this time, the top cap will brown and dry somewhat. 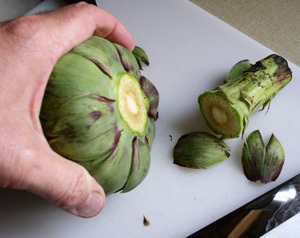 To check whether the artichokes are done, stick a fork through the top down through the center. It will pierce the heart with no trouble. To eat, pull off one leaf at a time, place the bottom end in your mouth and clamp down firmly with your teeth. Pull the leaf from your mouth, scraping the stuffing off with your teeth, then discard the leaf. (Don’t forget to eat the stems at some point.) When you have eaten far enough into the center, where the tough outer leaves give way to the smaller, tender leaves, you are near the heart. You can eat these inner leaves whole. When the leaves get too small to mess with and you reach the part where the tips are purple and prickly, gently scrape these inner leaves, along with the “hair” under them, off the heart with a fork. If the artichoke is properly done, this will practically lift off. You may now eat the heart. My dad’s favorite accompaniment to artichokes was a loaf of Italian bread (or French, something with a nice, crisp crust) and plain water. He said the artichokes made the water taste sweet.